St. Kilian's Community School News: Scholarship Success! 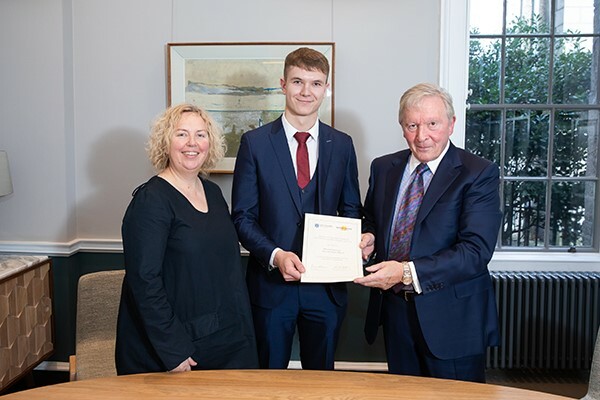 Mikolaj Piotrowski (Leaving Cert 2016) is one of the four recipients of this year’s highly prestigious Kinsella scholarships at Trinity College Dublin. The recipients of the award are all Second Year Engineering students at TCD who have demonstrated outstanding potential in the engineering field. The awardees are selected by a panel made up of experts from Trinity and the Jones Engineering Group. The Kinsella Scholarships were established in 2014 through a donation from the Executive Chairman of Jones Engineering Group, Eric Kinsella, and his wife, Barbara.